Edgar C. Whisenant predicted that the Rapture would occur in 1988 in his book “88 Reasons Why the Rapture Will Be in 1988”. When his prediction did not materialize, Whisenant wrote “89 Reasons why the Rapture is in 1989”. Colin Deal authored a book called, “Christ Returns by 1988”. J R Church clearly writes that 1988 would be the year that Christ would return in his book “Hidden Prophecies in the Psalms”. It turns out that Ahnsahnghong predicted that Christ would return in 1988 as well. Ahnsahnghong’s prediction was recorded in his own writing which you can read here http://www.ncpcog.com/book/bridegroom/bridegroom.html. See pages 10, 17, 24 & 26. The site is a bit slow, so give it time to load. Click here to see a pamphlet that the WMSCOG circulated in 1988 warning the public in S. Korea about the end of the world. Here is a website posted by a World Mission Society Church of God (WMSCOG) member which talks about it. The author of this site claims that Ahnsahnghong made this false prediction of Christ’s return in order to fulfill the “prophecy of Jonah”. This doesn’t make any sense. Were the other three false prophets listed above also fulfilling the same prophecy right along with Ahnsahnghong? No. They are false prophets, and so is Ahnsahnghong. In my experience in the WMSCOG, the pastor spent an entire service explaining why Ahnsahnghong predicted that the world would end in 1988. The pastor, like the blogger referenced in the previous paragraph, also explained that this prediction fulfilled the “prophecy of Jonah”. Jesus said in Matthew 24:36 that no one knows the day nor the hour, only the Father. Therefore, since Ahnsahnghong’s 1988 prediction did not materialize, not only is he not the “father” as some WMSCOG members refer to him, but he also clearly violated Matthew 24:36, by claiming to know when Christ would return. You ask others to provide “historical evidence” for their claims, yet you base this rather large accusation on a blog from a website that has three or four paragraphs? Isn’t that a bit hypocritical? No, actually this was based on personal experience. Thanks for your comment. I have updated the article to include this, and also to link to a copy of the pamphlet that the WMSCOG distributed concerning this topic. At any rate, I take it you have not been in the WMSCOG long? When I was there, there was an entire sermon dedicated to this topic. Actually I asked my Pastor about this after searching for hours on the computer for any evidence of this and he seriously looked confused when i told him that people were accusing Christ Ahnsahnghong of predicting the end in 1967(?) and in 1988 also. That pamphlet is the only thing close to being credible except for the fact that there’s no date or even a mention of the WMSCOG, although it does spell Christ Ahnsahnghong’s name wrong…it seems like someone tried to interpret the Bible themselves and taking matters into their own hands made pamphlets to try and warn others. Thanks for commenting on the site. We really appreciate the opportunity to dialogue with WMSCOG members. I guess that you don’t know that the WMSCOG did not always go by that name. They used to be called Church of God, Association of Ahnsahnghong’s Witnesses. The name was changed some time after his death. Did you know that there is another “Church of God” that follows Ahnsahnghong’s teachings? It is called the “New Covenant Passover Church of God”. I have spoken to an elder there that informed me that they believe in Ahnsahnghong’s teachings and pray in the name of Jesus (feel free to call them at the number listed on their page). According to the elder at the NCPCOG, Ahnsahnghong prayed to Jesus and baptized in the name of Jesus as well. The NCPCOG does not believe that Ahnsahnghong was the second coming of Jesus but instead call him teacher or prophet. 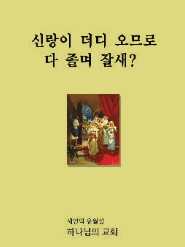 You can see all of Ahnsahnghong’s books (in Korean) and listen to some of his sermons on their website http://www.ncpcog.com. Here is the link to the book that Ahnsahnghong wrote regarding his 1988 (see p. 10, 17, 24, 26) and 2012 (see p. 16) predictions. After you click the link, you will have to give it a second to load. http://www.ncpcog.com/book/bridegroom/bridegroom.html Hope this helps. yes so much for their teachings about the name church of God being fulfilled for 40 years another lie about there history. The koreans know all about the NCPCOG and if you ask them about it they will not have much to say in regards to ther combined history. After 14 years I never knew the NCPCOG existed. I asked if ASH had any childern and they said no another lie. they pretend to know northing they are full of lies and deception and I could tell you 50 lies I have heard over the years.Do you think God lies? fyi koreans spell their names backwards and forwards thats why the name seems to be differant. Also what was included in that sermon you heard about 1988 had to be predicted to fulfill the prophecy of Jonah? 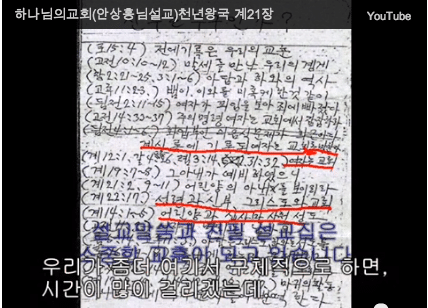 I’m surprised that your pastor is confused about Ahnsahnghong’s 1988 prediction since it is recorded in his own book here http://www.ncpcog.com/book/bridegroom/bridegroom.html. Maybe you should forward the link to your pastor. I remember that the pastor at the location I attended claimed that since Jonah warned the people of Nineveh that destruction would come to them in 40 days, Ahnsahnghong predicted the end would come 40 years after he was baptized in 1948. But interestingly, the earliest publication date of the book where Ahnsahnghong makes his prediction is 1980. That means that he officially warned the people of S. Korea only 8 years before. Therefore, Ahnsahnghong did not fulfill the WMSCOG’s self-manufactured “Jonah’s prophecy”. Since the WMSCOG did not expand to the United States until 1998-99, Ahnsahnghong did not bother to warn the rest of the world either. Needless to say, the world did not end in 1988, even though Ahnsahnghong predicted it. Thanks for the translation but I’m not finding anything on the internet to back up your claims, maybe if i could read korean that would help haha…by the way have you ever been taught prophecies like the 7 feasts or 2300 days? You’re not finding anything on the internet to back up my claims? I just sent you a link to Ahnsahnghong’s own writings. lol. You can ask someone who speaks Korean to translate it for you, or you can wait for the English translation, which the NCPCOG informs me they are working on. No, I have not been taught the prophecies of the 7 feasts or 2300 days that you speak of, but there are plenty of other ones already debunked in our Evidence section. The fact that you don’t know such INCREDIBLE prophecies pretty much proves that you never spent much time towards giving the Church a chance. I highly encourage you to go back and ask to be taught more before you make a website dedicated to ripping on something you don’t know that much about…and there are no contradictions in the Bible. Sure to someone who lacks an understanding of how the Bible works would say there are contradictions but there is none…please for the sake of your salvation give Father Ahnsahnghong, the Holy Spirit another chance! Actually Nick, I spent over a year at the WMSCOG studying. I just never got to do the two 6-hour or so long studies that you are referring to. The contradictions that I was referring to were NOT in the Bible. I was referring specifically to the contradictions in the WMSCOG Bible studies. For example, the belief that humans were angels before. If you take the time to read the series on the Angels, you may see what I mean. There are over 20 contradictions in our Evidence section. I also could not ignore the fact that Ahnsahnghong misquotes the Bible. Does God make mistakes? If you haven’t done the longer studies like 6 day creation, the feasts, 7 churches, or anitchrist, then you obviously haven’t been in the church for too long. All of these explain many historical events that have happened since the time of Jesus, yet they were written hundreds of years before they occurred. They prove completely why there are so many churches out there, doing disgusting things in the eyes of God. For example, worshipping the sun god unknowingly, erecting idols, and celebrating pagan festivals. By the way these were all things recorded in the old testament that happened to the Israelites which are happening again. Also, Christ AhnSahngHong never said a date when the world will end in ANY of his writings. He just urges us to keep Passover before it happens. Adam, please elaborate on the statements you make. It would be helpful if you included some historical or Biblical references so that our communication is clear. I would like to be considerate to our readers and make it a little easier for them to follow the dialogue. That being said, did you read the article above where I provided a link to Ahnsahnghong’s book where he does predict the end of the world in 1988 and 2012? Here is the link again: http://www.ncpcog.com/book/bridegroom/bridegroom.html. See pages 10, 17, 24 & 26. The site is a bit slow, so give it time to load. In the article there is also a link to a pamphlet that was circulated by the WMSCOG when they were known as the Church of God, Association of Ahnsahnghong’s Witnesse, that warns the people of S. Korea about the end of the world in 1988. Ahnsahnghong’s own writings about his apocalyptic predictions are out there and the WMSCOG still denies that the predictions were ever made. What will it take for you to stop ignoring the inconsistencies and hypocrisy between what Ahnsahnghong actually wrote and what the WMSCOG teaches? [rude portion deleted by admin] Do you have copies of that pamphlet and those books in your possession and they’ve been tested to make sure they are legitimate? If not than you are doing the same thing you are accusing the WMSCOG of doing..
Did you get a translator and go on the NCPCOG website so you can see and hear ASH is teaching something different than what the WMS claims? I know the WMS claims that are not ASH voice but it his voice I have heard it for 14 years. The tape recordings may be old but that is him. Or are you to lazy to have a nonmember translate it for you. the study’s conclusions are different. Actually, the link isn’t working. I’ve read all AhnSahngHong’s books and I never saw anything indicating a date of the end (The day comes like a theif 2peter3:10). He does mention scientist are warning about the end times. Also, i’ve never heard of ncpcog, but it isn’t wmscog. Notice the different names. I do know that there were people who didn’t believe in Mother so the church split. Honestly, there is no need to elaborate on the studies as it isn’t related to the subject. They describe Gods administration work beginning with the knowledge of God and ending with the last Adam and last Eve. How the church was messed up throughout the centuries according to prophecies, why certain events like William Miller, and Jesus’s ministry occurred, and that the [offensive portion removed by admin] are the anitchrist. Somewhere on this site you stated that was a teaching of SDA, its true, they understood it, but no longer can prove it through scripture. (Prophecy of the feasts) If you want to really want to try to cut down the truth, please ask your friend to show you these prophecies. LOL you make that statement and yet I will asume you have never one time studied with the SDA have you. You just take them at their word? Adam I have been in church for many years and the books has been replaced about five times and every time the church reprints those books the church makes every effort to collect the old ones. It’s because the church did not want anyone going back and making a comparison and seen the change in doctrine as the church changes its position The older members still have some of the old books and there are many changes to speak of. That also includes the preaching guides and as the books have changed so has the teachings of the WMSCOG. I am telling you first hand I have been there since the church started in LA. There are many people that are making the same statements and we are all witnesses to the changes taking place. God does not change his ways or mined therefor the teachings of WMSCOG should remain the same unless someone is changing his word. General Pastor and several others rewrote ASH teachings to serve their own purpose. Didnt God say that the Ninivites were going to be destroyed at a certain time period? He told His prophet to warn the people of the coming destruction, but it never came. I’m not saying Ahnsahnghong did or didnt say the world would in 1988. But if He did, that doesnt necessarliy mean He is a false prophet. God said that Ninveh would be destroyed at a set time, and it did not come, yet you still believe in the Bible don’t you? (yes) Then you cannot say that b/c God said the world would end in 1988, and it did not come, that He is not God. On one hand, prophecy did not come true and you still believe. But on the other, prophecy did not come true and you do not believe and call the prophet a flase witness. I think the phrase, you cant have your cake and eat it too is a good one here! Interesting point. Now let’s look further into why God chose to have mercy on the people of Nineveh. Jonah 3:10 tells us that the people of Nineveh turned from their evil ways of worshiping idols (Jonah 2:8). Therefore God chose not to bring the destruction that He threatened. So let’s say that Ahnsahnghong did predict the end in 1988. (We believe Ahnsahnghong did predict the world would end in 1988 because the pamphlets publicized on Korean internet sites provide support for this.) What evil did the world turn away from in 1988? The WMSCOG considers the cross an idol. Did people all of the sudden stop “worshiping the cross”? Was the destruction only for South Korea? If not then Ahnshanghong would have had to warn the whole world. Did that happen? So does that mean that Harold Camping isn’t a false prophet even though his prediction didn’t come true earlier this year? That is true God gave them one more chance because they repented their sins. Problem is that was a onetime deal. The bible and the WMS teaches if you continue to sin there is no more atonement for your sins because Crist died ounce and for all. If you continue to sin you crucify Crist all over again which the WMS loves to do. God destroyed many nations and people for their sins for this very reason. To assume God will just keep giving more time and putting off ones punishment again and again is what you hope for because you and the WMS sins are so grievous and through your lies and deception you continue to crucify Crist again and again. Hey whoever is running this site: when i click on the link to read http://www.ncpcog.com/book/bridegroom/bridegroom.html. it is in Korean I think, how do u read it in english? Jose, thanks for commenting. The NCPCOG tells us that they are in the process of having the books translated. These are the translations that we have so far here. Jonah is the explanation of the early rain which WMS claims to represent 1988. The WMS claims it did not take place because Jonah’s preaching that the end is coming to the city because of the people’s sins and that they then repented so God did not destroy the city. The later rain which was taught as 2012 because God gave more time. It’s all BS I have heard the underlining message for 14 years and at this point it makes me sick. In 1999 to 2000 the church message was about the world going through all kinds of trouble because computers where not designed to switch over for 2000 and how it could cause all kinds of global trouble including nucular countdowns,banking and finantual and that list went on and on. The WMS even showed us a 30 min film which was to scare the hell out of you explaining all that could happen including nuclear explosions it was a crazy film which had us all packing emergency supplies and backpacks. I still have mine. When nothing happened the church claimed mother just wanted to see who had faith by observing who prepared there emergency supplies. The church even gave $500 dollars to some members so they could prepare not feeling left out. At that time there where only around 30 American members in Los Angeles church and we had just moved to Sunland CA. This negative message about the end taking place sometime soon is used as a motivator to control ones actions through their faith and the hope of salvation and fear of hell and that date or time is continually being moved around as seen through peoples stories within the WMS. My x wife who is still in the church taught to all her friends and family the message of 2012 and now she claims she did not teach that, but she did through many different teachings including the 2300 days and nights another teaching that has changed. Her family can testify to this fact. When I confronted her with this she said well sometime soon it will tack place maybe in the next ten years I even hear the WMS said atonement day now lol. With this message of the end coming soon which is a joke on all there members I have watched as kids have dropped out of high school, collage, quit their jobs and people Simi retired and stopped planning for any future something I went through myself. As I explained to my x wife 14 years in church and now 2012 has been moved out another 10 years that’s not soon it’s a third of my life if I make it to the age of 75 how is that soon. Whoever reads this don’t be a fool work hard and enjoy growing old and good luck I will talk more about their message later. I was with the Church of God. They said to me the world will end in 2012 too and my teachers said nuclear weapons and talk of war in the media were signs that the world was ending in 2012. I never preached. The constant fear of the end, was paralyzingly. Other members preached it was glory, I felt that the life I wanted for myself was over. Heartbroken. I’m sure that the WMS would have some kind of answer. For people who are not under the control of the WMS the “answer” would seem seriously flawed. Why would we not be able to see their “truth”? The answer for that would be something like, “The truth is not in them so they do not know the truth when they hear it.” The story that they might give, whoever would listen, probably would be something about one event being a shadow and the other one being a reality. i think no one is under the control of anything. everyone makes his decisions and is responsible for them.church of god doest point anyone with a gun to believe… everyone is believe to his god but the point is to find the perfect truth. thats why i asked this question just to know but doesnt seem to know anyone to answer. Ahnsahnghong never wrote this. you people just believe what others say without any evidence…so this kind of people are under the control of others…. But Ahn wrote many statements contradictory to what WMS teaches. Although they don’t point a gun, they are so highly suggestive that their tactics work. Having a family member that was under this groups influence I CAN speak from a position of authority about the control that is placed over members! If you choose not to listen that is your failure not ours. Ahns teachings include timetables for Jesus return which includes timeframes such as 1967. Just like the failings of the early SDA movement, Ahn failed at his prediction for Jesus return. The Bible teaches that this is proof of a false prophet but once again, if you choose not to hear this it’s your failure not ours! You chose to speak things like this: you people just believe what others say without any evidence…so this kind of people are under the control of others…. I don’t know how deep you are into this but you’re not the first one to come at us like this. You seek “perfect truth” amoung men. Once again, your failure not ours. If you have any evidence that we have not been able to punch holes in both Biblically and factually not to mention historically and statistically I would love for you to produce it. Please spend a great amount of time viewing what is shared in this website. If you really are seeking for truth you WILL find out in short order that the WMS does NOT have it! You have an opportunity here. What you choose to do with it is totally up to you. Don’t blow it! Have you been reading? Tons of evidence points to ASH being a fake. Romans 6:9. Period. No WMS fluff trumps that. IF AHn is 2nd coming Christ, then he CAN’T die again, according to this scripture. No Philosophical jargon can be added to it. I was a member for a couple of months in South Africa and I tell you this message is the furthest thing from the Gospel of truth which is the Good news in Christ Jesus. I was so conflicted and felt like I had to earn my way into heaven with all these old rituals and spending the entire day at church bible studying. They try and wear you down with all of these teachings and bait you with the basics of Christianity then twist it all and then bring on their revelations! At first glance it appears to make sense, but there are so many inconsistencies and once you start asking questions it’s the devil working in you. The leaders wanted to ship me off to Korea to meet mother but first I had to fill in a form with all my hobbies and likes and names of parents and other personal information, so that there would be some sort of revelation once I met her, she would know me and what I liked. There was an issue at one of the Universities where they had been banned and when I asked about it, it was hushed and no proper answer was given. (mind you they didn’t know I knew they had been kicked out) I just asked why they were no longer going there. To make a long story short I was still conflicted after so many inconsistencies and one night in tears prayed to God to reveal the truth to me. I sat on my bed with my bible and asked God to please show me the truth. God reveled his truth in the most miraculous way by me opening the bible to Jeremiah 7 which is titled “False Religion is Worthless” and even more direct paragraph 18 makes reference to a Heavenly Queen which the people were praising which angered God! What a powerful revelation straight from God, he heard my cries. I urge everyone like the bible says to test the spirit. What I learnt out of the whole experience is study your bible, don’t just believe what anybody tells you. God is faithful, we are righteous through faith in Jesus Christ who came to set us right with God and if we focus on him and his free gift of grace, as all fall short of the glory of God we will be saved. Jesus is the realisation of our faith and the truth the way and the life, and he has borne all our sins and paid the price for our sins. That is why he will be praised and exalted forever and we should never forget the cross. The devil will even twist the words of God and use it to confuse you. I was so fearful of eternal condemnation and the world ending, and felt like I was being worn out and could not attain everlasting life through my works. God does not give us a spirit of fear, yet that is what I felt. Fear and guilt. You are set free through Christ, how wonderful to know what a friend we have in Jesus and that we are nolonger under the law which brings death, but under Jesus who forfilled the law in his holiness. Through one man came all sin and through another came complete restoration, redemption and reconciliation with God. I will continue to pray for anybody who feels confused and conflicted that God in his infinite mercy and perfect timing will reveal The Truth. The evidence for the end times prediction by ahn sahng hong got removed.. Where can I get them? Hahaha ADMIN..this is really a false claim…not even knowing the prophecy in the bible how Father Ahnsanghong fulfill the prophecy..before you act like this, first examine your belief if you follow the prophecy in the bible. then if you believe your following the prohecy according to your belief, then state the prophecy which fulfill accurately… hahaha what a nonsense claim..by the way you remind me the teachers of the law who accuse Jesus 2000 years ago which give them a miserable end and results…..